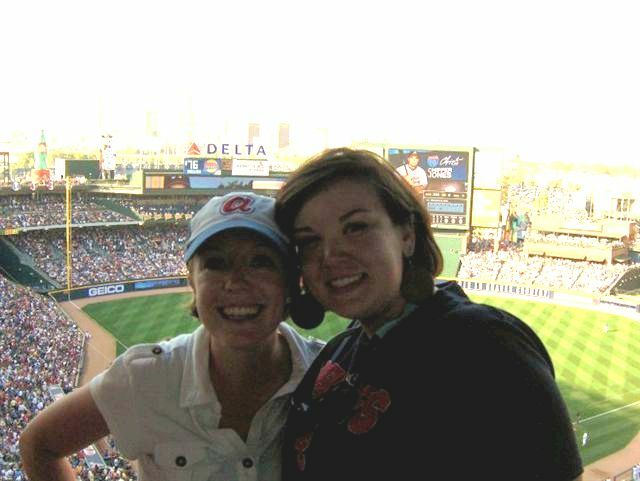 This year, just like many years passed I got a group of friends together and purchased a block of tickets to OPENING DAY 2010 - BRAVES v. CUBS. Game time was 4:10pm so we planned to arrive in the parking lot around noon so we would have ample time to tailgate before game time. There were about 20 friends attending the "party" all brining chips, beer, cookies, coleslaw, etc and I was in charge of the BBQ sandwiches. All in all the day was a HUGE SUCCESS: a Monday off, beautiful weather, lots of fun friends, and the Braves won 16-5. Here is how I made and transported the pork, and even if I do say so myself it was delicious! I was feeding around 20 people and purchased 2 pork shoulders (aka Boston Butts or Bone in Pork Roasts). They were 10 and 11 pounds and this was more than enough food....I should have used either one large 13 pound shoulder or 2 small 7 pound shoulders for about 13-15 pounds total; so now I (and you) know. Mix all of the rub ingredients together and massage all over the pork. Place the shoulder(s) in a roasting pan fat side up. Pour milk into the pan until it is about 1/4 of an inch up the side and then chicken stock another 1/8 of an inch up the side for a little less than1/2 an inch worth of liquid, do this carefully as to only get liquid in the bottom of the pan and not splashing the rub off the pork. I know this sounds crazy, I thought so too the first time but something about the milk and chicken stock keep the pork perfectly moist. Cover the pan tightly with aluminum foil, as air tight as you can, and place in a 200 degree oven for 8 hours. Yes, this is a long time but low and slow with meat like this works the best. And resist the temptation, don’t open the oven, don’t pull back the foil, don’t touch it! Best case scenario: put it in when you go to bed and take it out when you wake up. After the long wait remove the pan from the oven, check with a meat thermometer to ensure the pork has reached at least 160; remove the shoulders to a cutting board to cool enough so you can handle them. Once cool, pull the pork off the bone into small pieces, I found the best way was to hold a chunk of the meat stable with tongs and pull pieces away with a large fork, keep shredding and pulling until all of the meat is down to your desired size. Pour the juices from the pan through a colander/sieve to remove all the “fatty chunks,” I did it twice just to make sure I got it all. Pour the juices into a sauce pan and simmer on medium low for about 40 minutes or until it reduces to about a quarter of its original volume, about every 10-15 minutes while simmering skim the fat off the top with a spoon. Once reduced stir in all the other ingredients, simmer for 4-5 minutes then carefully taste (don’t burn your tongue) and adjust seasonings. Pull the pot off the stove and let the sauce cool before putting into a squirt bottle. While the sauce was still hot, I put about 1/4 cup of sauce on the meat so it could soak up all the goodness! This was delicious!! Thanks for being awesome. Milk? Really? I am definitely intrigued and am gonna give it a shot. Great blog L!